Would you tackle a burglar? 26% of people in Leeds would! 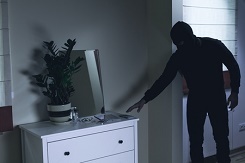 A recent survey commissioned by safe.co.uk has revealed that 31% of British homeowners would use physical force against a burglar if they caught them in their home. Of the 15 cities featured, Leeds sits around the bottom of the table at number 13 with 26% of people willing to take a burglar on but Sheffield tops it with 40% of people ready to fight an intruder off. Does that indicate that Yorkshire people are aggressive or that we’re not afraid of standing up for ourselves?! Overall, 33% said they’d make a noise to scare them off, 24% would hide in the house and call the police and 13% would try and get out of the house. Would you risk being hurt or even potentially committing a crime by hurting the intruder to protect your home and family? Legally you can use ‘reasonable force’ to defend your home though this, of course, is subjective plus you really don’t know who you’re up against and it could be a very upsetting experience for you and your family. Rather than face the prospect of being in this difficult situation, we would recommend that you take measures to fully secure your property so that you can avoid anyone breaking in in the first place. (Especially at this time of year as darker nights tend to bring more break ins). Luckily for you, we are in the middle of National Home Security Month – a national campaign dedicated to increasing awareness and sharing advice about home security. There is therefore lots of advice around on how to prevent burglars from even getting in which is a much better strategy than learning kung fu to fight them off! We have a number of posts on our blog around the NHSM themes and there are lots of tips on the official NHSM website as well. This ranges from physical security measures such as anti-snap locks and burglar alarms to behavioural issues such as always keeping the door locked, leaving lights on to make the house look occupied and keeping hedges trimmed back to deny them hiding places.